The Professional Footballers Union (SJPF) has this week publicly objected the Portuguese Football Federation's (FPF) plans of expediting citizenship for the Brazilian footballer Liedson, adding that they will be asking for a meeting with the chairman of the FPF and the national team's manager regarding the matter. 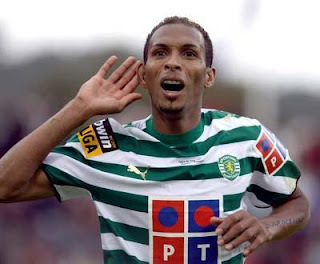 Joaquim Evangelista, chairman of the SJPF, said that Portuguese footballers are in danger of 'extinction' and that the FPF's intentions of providing citizenship to Liedson, in order to play for Portugal, will endanger the country's future as it will open the floodgates for other foreign players. The prolific Sporting striker, seen by many as a solution to the national team's inability to convert their dominance on the pitch into goals, will become the third Brazilian to play for Portugal, following the footsteps of Deco and Pepe. The SJPF said it has nothing against foreign players, but expressed concern that Portuguese footballers will lose value, which will finally lead to the loss of the national team's identity. Evangelista says he needs to speak of the matter with Luís Figo and Carlos Godinho, sporting director of FPF, as figures suggest that there is a growing tendency of hiring foreign players, with fewer Portuguese athletes playing football, which in turn doesn't afford them the possibility of progressing in their careers. His claims were made during the presentation of a study that looked into the use of foreign players in the 2008/09 season, showing that 55 percent of players competing in the First League were foreigners, one of the highest ratio's in Europe, second only to England. The study also showed that club teams favour older players (46 percent) aged between 24 and 28 years old. Rio Ave was the team with most Portuguese players, whilst Nacional da Madeira were on the opposite end of the list. The analysis was made of thirty European leagues and Portugal came second when it comes to foreign players competing in the top league of the country (53.7 percent), beaten only by England, which has 59.1percent of non-national players.